RWTH Aachen University is a large university located in Aachen, Germany. "RWTH" is the abbreviation of Rheinisch-Westfälische Technische Hochschule which translates into "Rhenish-Westphalian Technical University". However, officially, "RWTH" remains untranslated. The university is part of the Deutsche Forschungsgemeinschaft, a society of Germany's leading research universities. The RWTH Aachen University has an excellent reputation in chemistry, electrical and mechanical engineering and has partnerships with leading institutions worldwide. The university is member of several cooperations like the IDEA League, the TU 9 (German Institutes of Technology), the Euregio-University-Cooperation ALMA and the TIME-network. RWTH Aachen University is the largest university of technology in Germany and one of the most renowned technical universities in Europe. It currently has around 28,000 enrolled students, most of them in the field of engineering. Every year, a large number of international students and scientists come to the University to benefit from its high-quality study programmes and excellent facilities, both of which are internationally recognised. Almost 5,000 international students are currently enrolled in undergraduate, graduate and PhD programmes. 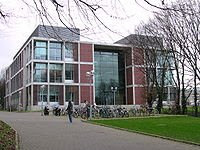 The proximity of Aachen to the Netherlands, Belgium and Luxembourg and its variety of cultural heritages has placed the University in a unique position for international collaboration with other educational and research institutions as well as with business and industry. Aachen's unique location in the "Euregio" border region is apt to enhance and accelerate research activities and technology transfer between Germany, the neighbouring states of Belgium and the Netherlands and Europe at large. 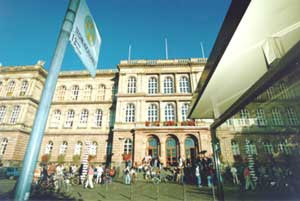 RWTH Aachen University was founded as a polytechnical institute (Polytechnikum) in 1870 by an industrial initiative, in a then fringe area of the Prussian heavy industry. As early as 1899, it was granted the right to award doctoral degrees. Re-established after World War II as the Institute of Technology of North Rhine-Westphalia (Rheinisch-Westfälische Technische Hochschule Aachen) it soon obtained the status of a university. Within a period of forty years, students numbers increased from around one thousand to 38,000 students in the 1990s. The rapid advance in the sciences and in engineering and the concomitant growth of the departments resulted in the creation of further faculties in engineering and the natural sciences. As early as the 1960s, the university met the increasing societal demands by expanding its range of degree courses. The Faculties of Arts and Humanities and Medicine were founded in the 1960s, followed by the Faculty of Business and Economics in the 1980s. Teaching and research are characterised by an international, innovative, and interdisciplinary approach and a close cooperation with business and industry. 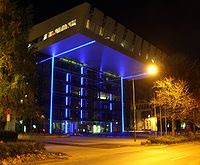 The main educational objective of RWTH Aachen Universitys is to provide solid knowledge of the basic scientific subjects, including the ability to apply this knowledge to engineering problems, and a high level of expertise in the various fields of specialisation, fostering the students' capabilities to transfer research results into economic and technical applications. In addition, the intensive interaction between the various fields of study in teaching and research is a direct response to the demands placed on future young professionals. Our engineering professors usually hold leading positions in industry before they become faculty members, and other experts from industry teach special courses which enable students to benefit from their expertise in bringing technological know-how to market. RWTH Aachen University has a long history of close and wide-ranging co-operation with national and international research centres and industries and thus contributes to the success and development of the German economy, increasingly extending this role within the European Union. Faculty nine was pedagogical sciences, but it was abandoned in 1989. Teacher education, however, continued.